"Anything by Drakes, especially when it comes to hoppy beers, is an automatic favorite in my book"
Now, this doesn’t happen too often, but when it does I become a “mad” fiend about it and tell everyone I know.Well, this very thing happened a few weeks back while picking up my some beers for the weekend at City Beer, my go-to beer store. While there, I noticed they had Drake’s “Aroma Coma” on tap. Anything by Drakes, especially when it comes to hoppy beers, is an automatic favorite in my book. Got a sample pour and what do you know? I bought several bottle there- after. What did I think? Popped the cap and the beer is poured. Poured a beautiful golden orange color with an egg-shell colored head. Settles quickly. Smell is big and floral. Grapefruit, mango and pine. This thing is a beautiful bouquet of citrus and has that hemp-kiss to it. The smell lives up to its name. The taste is big tropical up front and a nice solid pine kick. This is one smooth beer. Low carbonation makes this a quick easy drinker and the malt is nicely balanced. Crazy citrus with this bad boy. I have to say, this is now one of my favorite single IPA’s. For anyone likes Kern River Brewing Company’s Citra DIPA, you will surely like this. 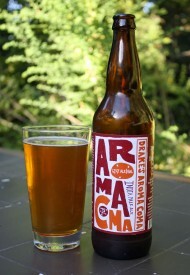 Drakes continue to be a great beer producer of hoppy beers and they are on a serious roll. Can’t wait for what’s next.